Will Newtown Prompt Gun Reform? 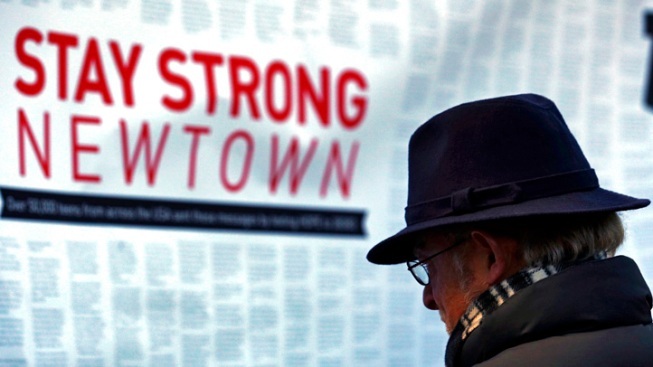 A man reads messages on a large poster board at a makeshift memorial near the main intersection of the Sandy Hook village of Newtown, Conn., as the town continues to cope in the aftermath of the Sandy Hook Elementary School shooting, Wednesday, Dec. 19, 2012. The gunman, Adam Lanza, walked into Sandy Hook Elementary School in Newtown, Conn., Dec. 14, and opened fire, killing 26 people, including 20 children, before killing himself. The never-ending and seldom-evolving debate over gun control has arguably reached its moment of truth: If the massacre of 20 schoolchildren in Newtown, Conn., doesn’t prompt America to clamp down on firearms, then perhaps nothing will. Other recent mass shootings – and there have been many before Newtown – have had little discernible effect on the public’s appetite for tougher gun laws. In Washington, the issue has been treated like a political third rail. But the murders of first-graders seem to have shaken something loose. Pro-gun politicians, including some Republicans, say they’re now at least willing to discuss gun control. President Barack Obama, who during his first term was noncommittal on gun control and in two instances chose to expand gun rights, first called on lawmakers to “take meaningful action to prevent tragedies like this.” He then set a January deadline for a task force led by Vice President Joe Biden to produce a set of "concrete proposals" to curb gun violence and vowed to push legislation "without delay." The question -- similar to the negotiations over the fiscal cliff – is if a sharply divided Congress can agree on a bill. 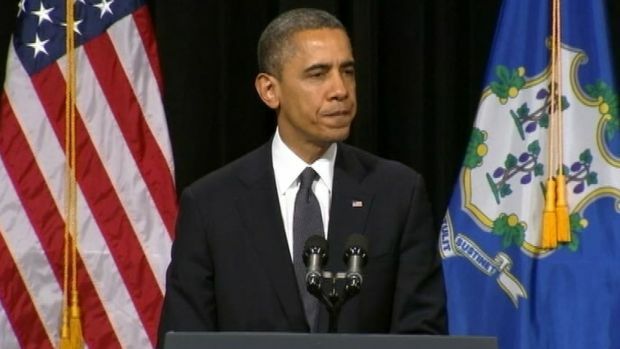 President Obama promises action during ceremony honoring victims of the Newtown shooting. The fact that there’s even the potential to pass some kind of gun control legislation is a big deal. The subject of reform comes up every time there’s a spasm of gun violence: shootings at a Sikh temple in Wisconsin and a movie theater in Colorado this year, the assassination attempt on Rep. Gabrielle Giffords in Arizona last year, 2009 rampages in Ft. Hood, Texas, Binghamton, N.Y., and Alabama. No piece of legislation came close to a vote. Even after the shooting of Trayvon Martin in Florida last spring, an incident that sparked debate over so-called "Stand Your Ground" laws, reform advocates could not muster any movement. Gun-control advocates blame the National Rifle Association, one of the most powerful lobbying groups in Washington, which has effectively framed the debate as a battle for the constitutional right to bear arms. Supporters of those rights – hunters, marksmen, people who carry guns for protection – say the vast majority of guns are owned by law-abiding citizens, and limiting gun sales would only help criminals. In recent years, the public has largely sided with the gun-rights camp. The last time a mass shooting sparked new firearms regulation was in 2007, after the killing of 32 people by a mentally disturbed student at Virginia Tech. That attack led to a law that helps states identify potential gun buyers with mental-health problems. The measure was politically viable in part because it did not include an outright ban on any particular weapon. The last significant gun prohibition was the assault-weapons ban of 1994, passed in response to a string of mass shootings, including a 1989 schoolyard massacre in Stockton, Calif. The law prohibited the manufacture and sale of semiautomatic weapons with magazines capable of holding 10 rounds or more. The law listed several makes and models that were off-limits, including the popular AR-15 rifle, a version of which was used by Newtown shooter Adam Lanza. The 1999 killing of 12 students at Columbine High School in Colorado occurred during the ban; one assault-style rifle the shooters used was bought by exploiting a loophole that allowed sales at gun shows. The ban expired in 2004, and, in a reflection of how opinion had shifted, Congress chose not to renew it. Seven states, including Connecticut, where the Newtown shooting took place, have imposed their own assault weapons bans. The rifle Lanza wielded, a .223-caliber Bushmaster, along with the handgun with which he killed himself, were all legally owned by his mother. Lanza is presumed to have shot her to death before heading to Sandy Hook Elementary School on the morning of Dec. 14. Now, in wake of that attack, Democrats are again urging a reinstatement of the assault weapons ban. And for the first time in 20 years, they might actually do it. The reason, Hudak said, is that the NRA really has no way to respond. After prior mass shootings, the group has argued that allowing more people – college students, high school teachers, school guards -- to carry guns would prevent such attacks. Besides, the vast majority of murder weapons are handguns, not assault weapons. But this time, there is no such alternative, other than putting guns in elementary schools. It remains to be seen if the shift in Washington since Friday is mirrored among the general public. Crime policy analysts say gun-control advocates risk losing their window of opportunity if they push a bill that asks too much. Philip Cook, a Duke University professor who has spent decades researching gun violence and crime policy, said the smart move by the gun-control advocates would be to seek a middle-ground proposal that reinstates the ban on large magazines and doesn’t touch the issue of particular guns or other military-style accessories. Most but not all gun owners would back such an approach, he predicted. A more innocuous proposal, if all else fails, would be to increase funding for states’ systems that allow them to cross reference criminal records with mental health records to weed out people who shouldn’t buy guns, Cook said. There’d be little resistance to that, he said. Hudak agreed. From the perspective of gun-control advocates, anything they can accomplish should be considered a victory. He pointed to New Jersey Sen. Frank Lautenberg, who suggested such an approach this week. “That’s the obstacle: to craft legislation in a narrow way that even gun rights people can get behind but also that people can understand,” Hudak said. Grant Duwe, a criminologist who co-wrote a book about mass shootings, agreed that it’s entirely possible for Congress to pass some kind of post-Newtown gun control legislation. But he questioned whether it would have any real impact on the frequency of mass shootings. His own research shows that gun control laws have little deterrent effect. He thinks the debate needs to shift to mental health care: More than half of the perpetrators of mass shootings in his study had some kind of mental illness, and a third sought help before their crimes.